A bit of a short campaign. New players might not like the aiming system. This game has got 'Shooter of the Year' written all over it! I have always been a fan of the Call of Duty series, and I must say that the fourth installment has been the best of them all. Actually, I do not believe I am making a good point. 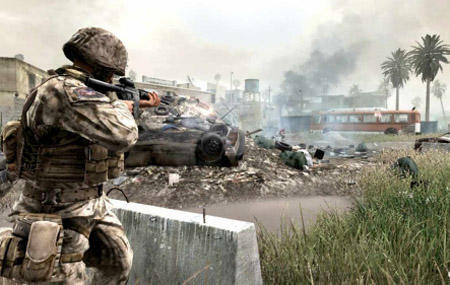 Call of Duty 2 & 3 do not even compare to Call of Duty 4: Modern Warfare. This game is amazing! This title has exellent gameplay, astounding visuals, realistic sounds, and phenomenal online play. I shall divide this review into different sections: Gameplay, Graphics, Learning Curve, Replay Value, and Sound. Learning Curve: I must say that this game is pretty easy to pick-up-and-go. Some people just might be turned off by the fact that you must zoom in and deal with the sight to succeed. Your gun is not accurate enough to hit anyone long range if you do not zoom in. (Note: Very Realistic) The controls are simple: X to reload, A to jump, RT to shoot, LT to zoom in, RB to throw 'nade, LB to throw secondary 'nade, left analog stick to move, right analog stick to move your gun (also known as move the cross-hair). Pretty simple control-wise. I just have one issue: to knife someone in close quarters you must press in the right analog stick, and that takes a bit of getting used to. Also to spring you must press in the left analog stick. I like the creative use of the analog sticks, but some people may not enjoy it at first. Other than that, I can not think of anyway that the learning falters. The objectives are self-explanatory, the combat easy to follow, overall a nice experience. I give CoD4's Learning Curve an 8.75 out of 10. 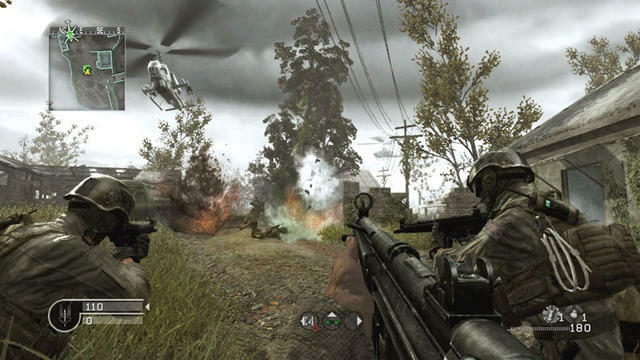 Sound: Call of Duty 4's sound is very realistic. According to my best knowledge Infinity Ward used real weapons to record the sounds for the guns. Each gun sounds exactly (or very close) to how it sounds in real life, except a lot quieter. (Those of you that have fired weaponry will have already known that) You are able to hear grenades as they bounce near you; you will notice the metal 'clink'. You hear the knife tear your enemy's clothes' threads. You hear the metal of your enemy's helmet getting pierced as you fire a headshot. If an enemy sniper is firing at you and they miss, you hear the bullet whiz by. These are all examples of how intricate the sound is in Call of Duty. I'm sure you won't be disappointed. I give CoD4's sound a 9 out of 10. 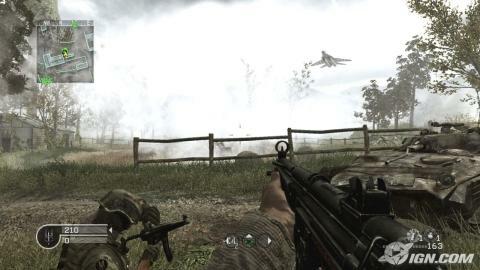 Overall: In conclusion, Call of Duty 4 impressed me. I was skeptical at first due to the third installment of the series. 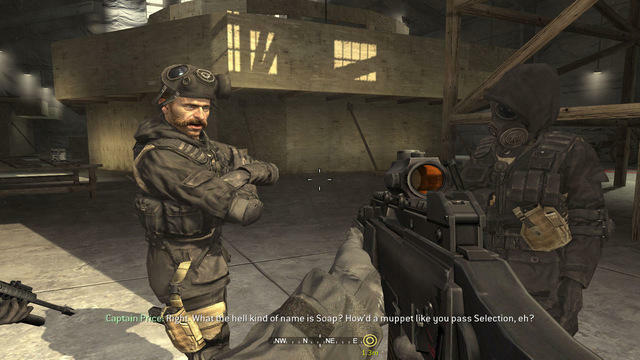 Call of Duty 4: Modern Warfare was a great treat, and I'm any shooter fan will enjoy it. 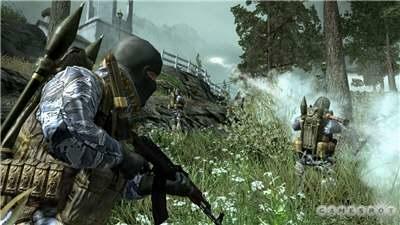 I give Call of Duty 4: Modern Warfare for the Xbox 360 a 9.5 out of 10.